Amidst unseasonably cool Florida temperatures, three days of Grand-American Road Racing cars begin to heat up Daytona International Speedway in preparation for the first major race weekend in North America, the 2010 Rolex 24-Hour of Daytona. With a temperature measurement of 53 degrees Fahrenheit on Friday represented the warmest weather for entire weekend test session, drips near the freezing point combined with precipitation actually created icy conditions that postponed morning testing on Saturday for the Rolex Sports Car Series. 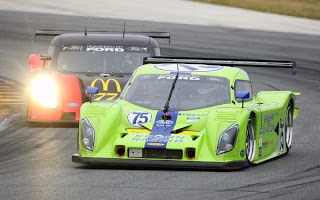 the Grand-Am Rolex Sports Car Series Daytona Prototypes and GT cars took turns around the 3.45 mile road course formulated from the Superspeedway complex. blazing around the track fastest has been the Suntrust-sponsored Dallara Ford wheeled by Max Angelelli. The 2005 Rolex 24-hour of Daytona overall race winning team and driver, the #10 Daytona Prototype clocked a lap of 1 minute, 40.466 seconds. Besides posting the quickest pass around the Daytona International Speedway, Angelelli has shown pace throughout the test weekend leading two of the three days on the time sheets. 2009 Grand-Am Rolex Sports Car Daytona Prototype series champion GAINSCO Racing Chevrolet driven by Alex Gurney, a Scott Dixon-wheeled Chip Ganassi Racing Riley breaking their new BMW powerplant and the Michael Shank Racing Riley-Ford piloted by Michael Valiante (who led the messy Saturday session in driving weather accustomed to Canadians) also showed nearly comparable speed through testing. 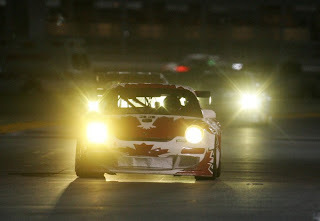 In the sampling of Rolex Sports Car GT cars, an Alex Job Racing-owned Porsche GT3 took top speed honours. Driven by 22 year old Austrian Martin Ragginger, the Porsche logged a lap at 1 minute and 49.627 seconds. With the factory-backed Pontiac Racing effort gone with the demise of the GM brand, the rock-steady Porsche squad's main nemesis for 2010 will be a race-hardened group of Mazda RX-8s. With one RX-8 driven and owned by actor Patrick Dempsey, another car campaigned by SpeedSource will offer a season-long fight for the German sports car powerhouse. Dialing in race cars within weather which barely reached average temperature lows for the Daytona Beach area for the late January event, horsepower was peak but tire grip was at a premium for the sports cars. In spite of this, the sessions endured only minor incidents such as spins and blown engines from select vehicles with all categories of drivers exercising caution. Serving as a test session for the prestigious Daytona Prototypes and GT class machines of the Grand-Am Rolex Sports Car series, the Continental Tire Sports Car Challenge vehicles are also unleashed in preparation for a 200-mile race to roll on the Friday before the day-long headline event. This year, the all-new competition versions of the Chevrolet Camaro and Dodge Challenger will meet making with a 5.0 liter Ford Mustang Boss 302R resembling a modern revival of the SCCA Trans-Am series (In fact, a #6 Camaro and #15 Mustang showed up with paint schemes iconic with the late 1960s to early 1970s glory days). 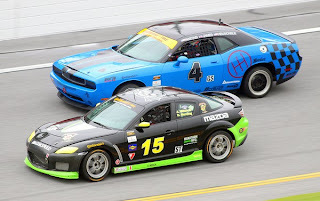 Split into two classes of competition, the Continental Tire Sport Car Challenge features their faster, more powerful car in the GS (Grand Sport) class and the ST (Sport Tuner) Class for smaller race cars which will include the MAZDASPEED3 and Subaru Impreza WRX STI as newcomers for 2010. 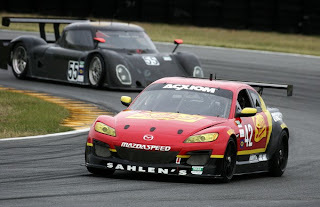 With 54 cars total showing up for the Daytona test, the 2010 race for the Continental Tire Sports Car Challenge guarantees to be a well-contested affair. The perennial kick-off to the 2010 racing season in North America, the clock for the Rolex 24-Hour of Daytona will start at January 30th at 3:30 PM Eastern time.